This Friday marks the first day of spring! Get your hands on some seasonal fresh rhubarb, and make this delicious chutney with goat cheese on crostini, or spoon it over pork tenderloin. It’s nearly spring! I’ve already babbled about my excitement in other posts. My excitement over the ability to go outside without a jacket. To wear maxi skirts and flip flops. The opening of local farmers markets. Fresh spring produce. Last spring, I tried rhubarb for the first time. I was always hesitant to try it before, and I really couldn’t tell you why. Probably left over from my picky childhood days, when I wouldn’t touch anything that either looked or sounded funny. I discovered that I actually really like rhubarb! It’s a vegetable, though since it’s often used as a fruit, it is sometimes classified that way. It tastes sour when eaten raw, and cooking brings out the sweet/tart side of it. It’s very low-calorie, and loaded with several B-complex vitamins (such as folates, riboflavin, niacin and vitamin B-6), vitamin A and vitamin K.
This chutney walks a fine line of being sweet AND savory. It could be enjoyed at any meal: on toast for breakfast, stirred into brown rice for lunch, or spooned over pork tenderloin for dinner. It keeps very well for about two months, stored in an airtight container in the refrigerator. If you can’t find fresh rhubarb, you can use an equal amount of frozen rhubarb. You can add it to the saucepan still frozen, it will just take longer to cook and thicken. Combine all of the chutney ingredients (sugar through garlic clove) in a medium saucepan. Bring to a boil over high heat, then reduce heat to low and simmer, uncovered, for 45 minutes to an hour, stirring frequently, until thick. Set aside to cool. To prepare crostini, spread baguette slices on a baking sheet. Mist lightly with cooking spray, or brush with a scant layer of olive oil. Bake the slices in the oven for 5 to 10 minutes, until lightly toasted. 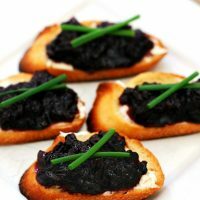 Spread goat cheese on each crostini, then top with some of the rhubarb chutney. Garnish with a small sprig of parsley or a couple of pieces of snipped chives. What a great spring recipe. I love the concept of this recipe and definitely am going to have to try it! We are big rhubarb fans over here and am imagining how well this chutney must pair with the tangy goat cheese. I have a feeling this chutney would be great over chicken or pork, too. I won’t ever turn down a crostini. Love the flavors here. Believe me, I’m counting down the days! Even though we have snow in the forecast for the first day of spring. Oh, this crostini looks just heavenly! We have snow in our first-day-of-spring forecast, too! Boo! 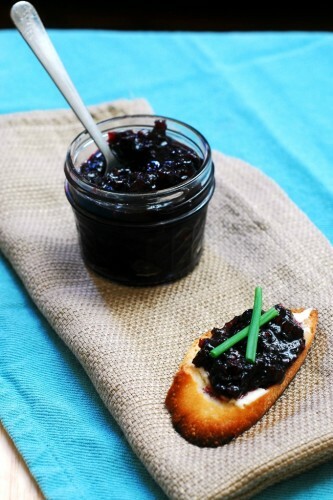 I love rhubarb and I could see myself using this chutney on everything…EVERYTHING. I always enjoy a good chutney but would you believe I’ve never tried rhubarb? You just don’t see it very much around here but I’m going to try to hunt some down and give this a try! Sounds delicious. This crostini looks delightful. I haven’t ever cooked with rhubarb, but the chutney here sounds so delicious that I might have to try it. I’ve never been a fan of rhubarb but mixed with the blackberry and I’m in! ON Friday we are supposed to get SNOW!!! SO much for spring in New England! 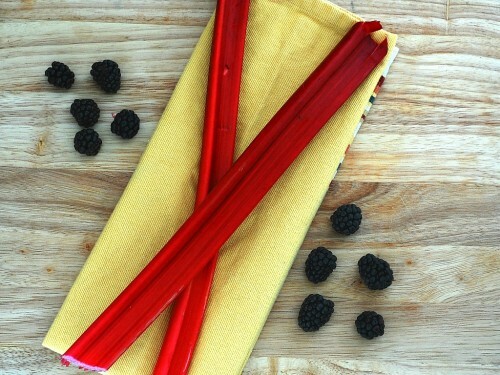 I love the combo of rhubarb and blackberries, how clever. I think I’ve only had strawberry and rhubarb together, and with goat cheese, SWOON! I can never get enough of rhubarb. It used to grow right by house so we put it in everything! 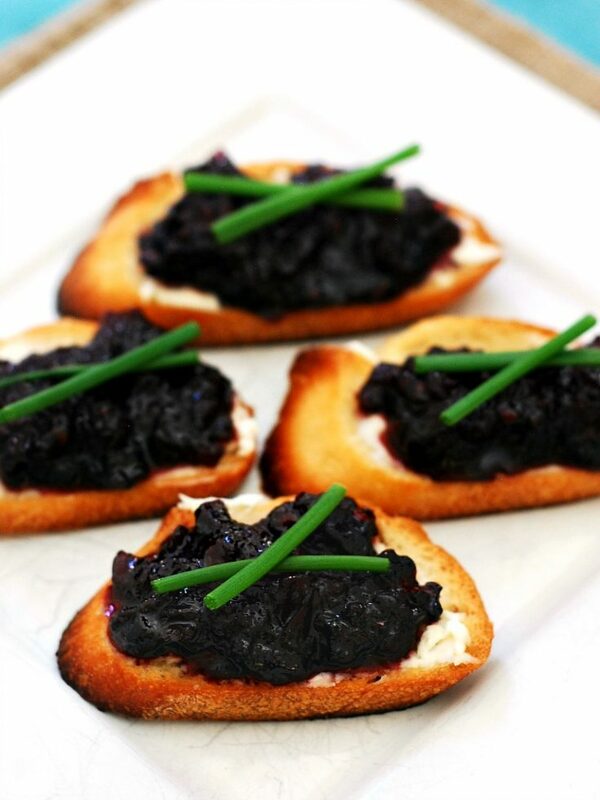 Love that you paired it with blackberries and goat cheese….yum! Rhubarb is one of my favorite things about spring.! What a great way to welcome the season!